Icon always comes with interesting nickname. Likewise, the iconic Puer tea nicknamed Ta Kou Zhong , 大口中, which is directly translated as Big Mouth Centre. 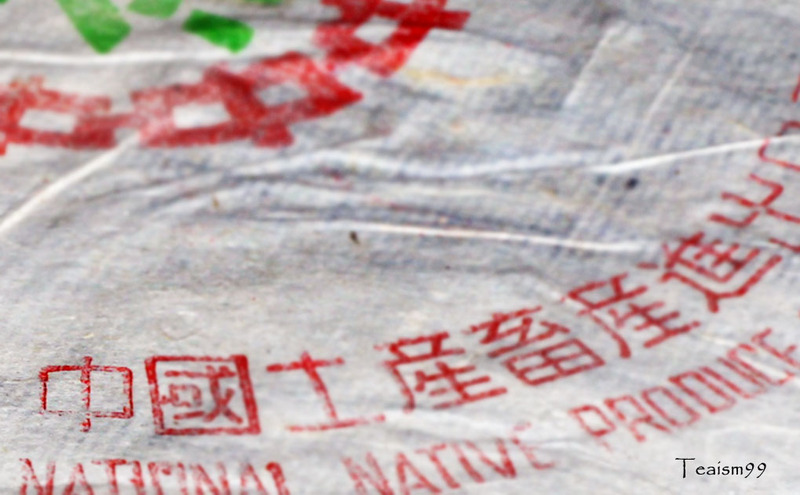 It refers to the character of Zhong 中 in the wrapper of Seven-sons Puer tea cake made in 1970s to 80s and also some tea cakes wrapper of the early 90s made by various producers. The stylized rectangle character of Kou 口 in the character of Zhong 中 is bigger than normal, and therefore Ta 大 is used to describe the unusually bigger size of Kou 口 in the word Zhong 中. That is how it gets its nickname from. This iconic Puer tea is said to be of higher quality and some described it as the tea that possess the dynamism and vitality of a galloping horse. Wow! Today, I will brew this (1970s 大口中) tea just to find out the truth behind its description. This piece of tea that I kept is very well stored. The tea leaves are clean, reddish dark maroon and smell fresh without any undesirable odour. After removing some tea leaves carefully, I refreshed the dry tea leaves and let it settle for a while before brewing it. The tea is really wonderful and last many brews. The colour of the brew is translucent golden amber. It is really very beautiful. This tea has a pronounced enticing taste of lotus and bamboo leaves aroma and sweetness with tranquil complexity. It also has hints of similarities to the 1950s Liu An tea that I had tried. The overall impression is quite far from any galloping horse dynamism or vitality as described by others, but close to something that we would describe as perfect. Voilà! Patiently, respectfully and attentively, as I sip this tea, just like when we are in the company of an honoured veteran.